The production team from Youmacon – a Detroit-based, four-day anime, gaming, art and comic convention celebrating Japanese popular culture – today announced details for Youmacon 2015, scheduled for Oct. 29 to Nov. 1 at downtown’s Cobo Center and Renaissance Center. Festivities will take place 24-hours-a-day beginning at 8 p.m. Thursday through 6 p.m. Sunday. Similar in theme to most major Comic Cons, Youmacon (named for the Japanese word youma, meaning demon or ghost) is an all-ages mix of interactive games and events, cosplay, celebrity guest panels, live musical performances, exhibitors, artists and more. 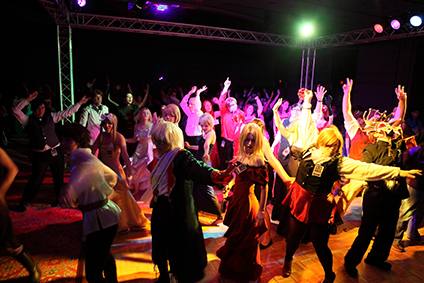 Highlights of the event, now in its 11th year, also include a Charity Masquerade Ball, video game and table top gaming rooms, a Live Action Mario and Donkey Kong Parties and a massive 100,000 square foot dealer’s room for shopping anime and other collectibles. Last year’s Youmacon drew more than 18,000 attendees. As part of this year’s larger-than-ever Youmacon, more than 30 anime industry celebrities and special guests are expected, including actors, producers, musicians, artists, and more. For a complete list of special guests, visit youmacon.com/special-guests. Registration is open till Sept. 15, online at youmacon.com/registration. Platinum passes are available for $125 and three day passes for $55. Following Sept. 15, tickets will only be available at-the-door. Pricing options include a three-day pass ($60) or Friday only ($30), Saturday only ($40) or Sunday only ($20) passes. Thursday evening’s activities are free and open to the public. Attendees should note that tickets sales are cash only. The Detroit Marriott at The Renaissance Center is serving as Youmacon 2015’s official event hotel, with overflow rooms available at the Westin Book Cadillac, Holiday Inn Express & Suites Downtown Detroit and the Greektown Casino Hotel. Complete event, registration and lodging information is available at youmacon.com.